Thirsty. Dehydrated. Parched. Summer can totally wreak havoc on your skin with its moisture-sucking elements and horribly hot temperatures. And so far this season has been interesting, to say the least -- 95 and sunny one day! 50 and raining the next! -- with all the rapid climate changes, my skin seriously doesn't know which way is up. 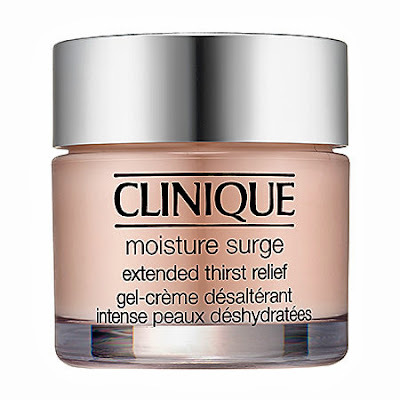 Luckily, Clinique Moisture Surge Extended Thirst Relief is here to save the day. I'm totally loving this moisturizer, which comes in a soothing gel form that feels cooling and fresh on the skin. The blend of hydration boosters and botanicals help to maintain skin's moisture and balance it throughout everything you face during a hot summer day, from humidity to air conditioning! The texture reminds me of the SK-II Whitening Source Intensive Mask -- it's light, wet and gooey -- but rather than leaving a slick sheen on the skin, it sinks in almost instantly. This baby can be used in two ways -- either as an all-day moisturizer (it lasts for up to 12 hours! ), or as an intense moisture mask. I prefer to use it as a mask at night -- it combats all the terrors my skin has faced throughout the day and keeps it smooth and supple all night long. I recommend splurging on this moisturizer, as it will last you throughout the summer months and maybe even into the fall! Plus the pink tub just looks so lovely atop the vanity. Do yourself a favor and surge forward into the moisture. Clinique Moisture Surge Extended Thirst Relief retails for $49.50 at sephora.com.